If you have spent some time in the market, then I’m quite certain that you’ve been bombarded with market jargons of all sorts. Most of us get used to these jargons and in fact, start using these jargons without actually understanding what they really mean. I’m guilty of using few jargons without understanding the true meaning of it and I get a feeling that some of you reading this may have experienced the same. One such jargon is – momentum. I’m sure we have used momentum is our daily conversations related to the markets, but what exactly is momentum and how is it measured? When asked, traders loosely define momentum as the speed at which the markets move. This is correct to some extent, but that’s not all and we should certainly not limit our understanding to just that. ‘Momentum’ is a physics term, it refers to the quantity of motion that an object has. If you look at this definition in the context of stocks markets, then everything remains the same, except that you will have to replace ‘object’ by stocks or the index. Simply put, momentum is the rate of change of returns of the stock or the index. If the rate of change of returns is high, then the momentum is considered high and if the rate of change of returns is low, the momentum is considered low. This leads us to to the next obvious question i.e is what is the rate of change of returns?. The rate of change of return, as it states the return generated (or eroded) between two reference time period. For the sake of this discussion, let’s stick to the rate of change of return on an end of day basis. So in this context, the rate of change of returns simply means the speed at which the daily return of the stock varies. Which stock has a higher rate of change in daily returns? Which sock has a higher momentum? To answer these above questions, you can look at either the absolute change in Rupee value or the percentage change from a close to close perspective. If you look at the absolute Rupee change, then obviously the change in Stock A is higher than Stock B. However, this is not the right way to look at the change in daily return. For instance, in absolute Rupee terms, stock in the range of say 2000 or 3000 will always have a higher change compared to Stock A. Hence, evaluating absolute Rupee change will not suffice and therefore we need to look at the percentage change. 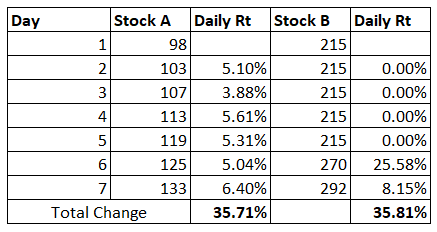 In terms of percentage change, clearly Stock B’s daily change is higher and therefore we can conclude that Stock B has a higher momentum. Stock A, has trended up consistently on a day to day basis, while stock B has been quite a dud all along except for the last two days. On an overall basis if you check the percentage change over the 7 day period then both have delivered similar results. Given this, which of these two stock is considered to have good momentum? Well, clearly Stock A is consistent in terms of daily returns, exhibits a good uptrend, and therefore can be considered to have continuity in showcasing momentum. Now, what if I decide to measure momentum slightly differently? Instead of daily returns, what if we were to look at the return on a 7 days basis? If we were to do that, then both Stock A and B would qualify as momentum stocks. The point that I’m trying to make here is that traders generally tend to look at momentum in terms of daily returns, which is perfectly valid, but this is not necessarily the only way to look at momentum. In fact, the momentum strategy we will discuss later in this chapter looks at momentum on a larger time frame and not no daily basis. More on this later. I hope by now, you do have a sense of what exactly momentum means and understood the fact that momentum can be measured not just in terms of daily returns but also in terms of larger time frames. In fact, high-frequency traders measure momentum on a minute to minute or hourly basis. Amongst the many trading strategies that the traders use, one of the most popular strategies is the momentum strategy. Traders measure momentum in many different ways to identify opportunity pockets. The core idea across all these strategies remains the same i.e to identify momentum and ride the wave. Momentum strategies can be developed on a single stock basis wherein the idea is to measure momentum across all the stocks in the tracking universe and trade the ones which showcase the highest momentum. Do note, momentum can be either way – long or short, so a trader following single stock momentum strategy will get both long and short trading opportunities. Traders also develop momentum strategies on a sector-specific basis and set up sector-specific trades. The idea here is to identify sector which exhibits strong momentum, this can be done by checking momentum in sector-specific indices. Once the sector is identified, further look for the stocks within the sector which display maximum strength in terms of momentum. Momentum can also be applied on a portfolio basis. This involves the concept of portfolio creation with say ‘n’ number of stock, with each stock in the portfolio showcasing momentum. In my opinion, this is a great strategy as it is not just plain vanilla momentum strategy but also offers safety in terms of diversification. We will discuss one such strategy wherein the idea is to create a basket of stock aka a portfolio consisting of 10 momentum stocks. Once created, the portfolio is held until the momentum lasts and then re-balanced. Given the above, here is a systematic guide to building a ‘Momentum Portfolio’. As you may know, there are close to 4000 listed stocks on BSE and about 1800 on NSE. This includes highly valuable companies like TCS and absolute thuds such as pretty much all the Z category stocks on BSE. Companies such as these form the two extreme ends of the spectrum. The question is, do have to track all these stocks to build a momentum portfolio? Not really, doing so would be a waste of time. One has to filter out the stocks and create something called as the ‘tracking universe’. The tracking universe will consist of a large basket of stocks within which we will pick stocks to constitute the momentum portfolio. This means the momentum portfolio will always be a subset of the tracking universe. Think of the tracking universe as a collection of your favorite shopping malls. Maybe out of the 100s of malls in your city, you may end up going to 2-3 shopping malls repeatedly. Clothes bought from these 2-3 malls make up for your entire wardrobe (read portfolio). Hence, these 2-3 malls end up forming your tracking universe out of the 100s available in your city. The tracking universe can be quite straightforward – it can be the Nifty 50 stocks or the BSE 500 stocks. Therefore, the momentum portfolio will always be a subset of either the Nifty 50 or BSE 500 stocks. 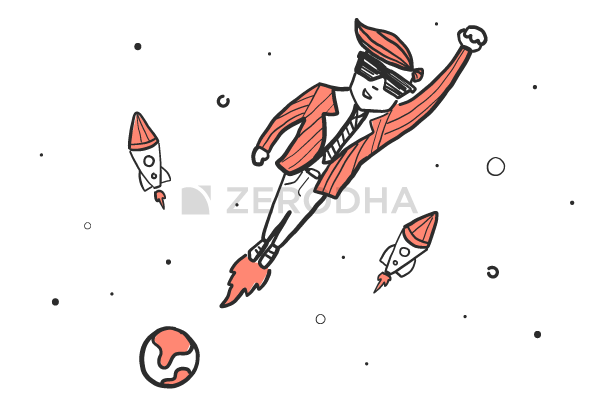 Keeping the BSE 500 stocks as your tracking universe is a good way to start, however, if you feel a little adventurous, you can custom create your tracking universe. Custom creation can be on any parameter – for example, out of the entire 1800 stocks on NSE, I could use a filter to weed out stocks, which has a market cap of at least 1000Crs. This filter alone will shrink the list to a much smaller, manageable set. Further, I may add other criteria such as the price of the stock should be less than 2000. So on and so forth. I am just randomly sharing few filter ideas, but you get the point. Using the custom creation techniques helps you filter out and build a tracking universe that exactly matches your requirement. Lastly, from my personal experience, I would suggest you have at least 150-200 stocks in your tracking universe if you wish to build a momentum portfolio of 12-15 stock. Assuming your tracking universe is set up, you are now good to proceed to the 2nd step. In this step, you need to ensure you get the closing prices of all the stocks in your tracking universe. Ensure the data set that you have is clean and adjusted for corporate actions like the bonus issue, splits, special dividends, and other corporate actions. Clean data is the key building block to any trading strategy. There are plenty of data sources from where you can download the data free, including the NSE/BSE websites. The question is – what is the lookback period? How many historical data points are required? To run this strategy, you only need 1-year data point. For example, today is 2nd March 2019, then I’d need data point from 1st March 2018 to 2nd March 2019. Please note, once you have the data points for last one-year set, you can update this on a daily basis, which means the daily closing prices are recorded. This is a crucial part of the strategy; in this step, we calculate the returns of all the stocks in the tracking universe. As you may have already guessed, we calculate the return to get a sense of the momentum in each of the stocks. As we discussed earlier in this chapter, one can calculate the returns on any time frequency, be it daily/weekly/monthly or even yearly returns. We will stick to yearly returns for the sake of this discussion, however, please note; you can add your own twist to the entire strategy and calculate the returns on any time frequency you wish. Instead of yearly, you could calculate the half-yearly, monthly, or even fortnightly returns. So, at this stage, you should have a tracking universe consisting of about 150-200 stocks. All these stocks should have historical data for at least 1 year. Further, you need to calculate the yearly return for each of these stocks in your tracking universe. To help you understand this better, I’ve created a sample tracking universe with just about 10 stocks in it. Once the returns are calculated, you need to rank the returns from the highest to the lowest returns. For example, Asian paints have generated a return of 25.87%, which is the highest in the list. Hence, the rank of Asian paints is 1. 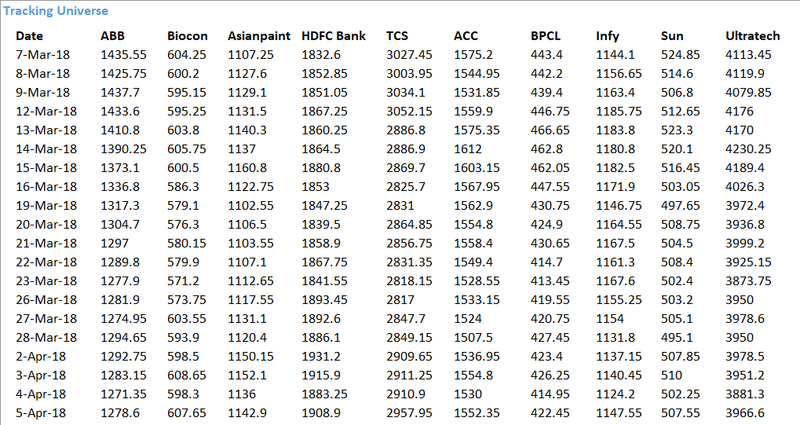 The second highest is HDFC Bank, so that will get the 2nd rank. Infosys’s return, on the other hand, is -35.98%, the lowest in the list, hence the rank is 10. So on and so forth. So what does this ranking tell us? If you think about it, the ranking reorders our tracking universe to give us a list of stocks from the highest return stock to the lowest. 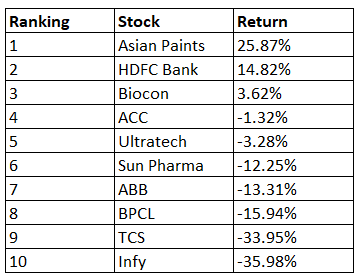 For example, from this list, I know that Asian Paints has been the best performer (in terms of returns) over the last 12 months. Likewise, Infy has been the worst. A typical tracking universe will have about 150-200 stocks, and with the help of the previous step, we would have reordered the tracking universe. Now, with the reordered tracking universe, we are good to create a momentum portfolio. Remember, momentum is the rate of change of return and the return itself is measured on a yearly basis. A good momentum portfolio contains about 10-12 stocks. I’m personally comfortable with up to 15 stocks in the portfolio, not more than that. For the sake of this discussion, let us assume that we are building a 12 stocks momentum portfolio. The rest of the stocks would not constitute the portfolio but will continue to remain in the tracking universe. What is the logic of selecting this subset of stocks within the tracking universe, you may ask? Well, read this carefully – if the stock has done well (in terms of returns generated) for the last 12 months, then it implies that the stock has good momentum for the defined time frame. The expectation is that this momentum will continue onto the 13th month as well, and therefore the stock will continue to generate higher returns. So if you were to buy such stocks, then you are to benefit from the expected momentum in the stock. Clearly, this is a claim. I do not have data to back this, but I have personally used this exact technique for a couple of years with decent success. It is easy to back-test this strategy, and I encourage you to do so. Back in the days, my trading partner and I were encouraged to build this momentum portfolio after reading this ‘Economist’ article. You need to read this article before implementing this strategy. Once the momentum portfolio stocks are identified, the idea is to buy all the momentum stocks in equal proportion. So if the capital available is Rs.200,000/- and there are 12 stocks, then the idea is to buy Rs.16,666/- worth of each stock (200,000/12). By doing so, you create an equally weighted momentum portfolio. Of course, you can tweak the weights to create a skewed portfolio, there is no problem with it, but then you need to have a solid reason for doing so. This reason should come from backtested results. So on and so forth. Ideally, the approach to capital allocation should come from your backtesting process, this also means you will have to backtest various capital allocation techniques to figure out which works well for you. So far, we have created a tracking universe, calculated the 12-month returns, ranked the stocks in terms of the 12-month returns, and created a momentum portfolio by buying the top 12 stocks. The momentum portfolio was built based on the 12-month performance, with a hope that it will continue to showcase the same performance for the 13th month. Now the question is, what really happens at the end of the month? At the end of the month, you re-run the ranking engine and figure out the top 10 or 12 stocks which have performed well over the last 12 month. Do note, at any point we consider the latest 12 months of data. So, we now buy the stocks from rank 1 to 12, just like the way we did in the previous month. From my experience, chances are that out of the initial portfolio, only a hand full of stocks would have changed positions. So based on the list, you sell the stocks which no longer belongs in the portfolio and buy the new stocks which have featured in the latest momentum portfolio. In essence, you rebalance the portfolio and you do this at the end of every month. Before we close this chapter (and this module), I’d like to touch upon a few variations to this strategy. You can do this on any fundamental parameter – EPS growth, profit margin, EBITDA margin etc. The beauty of these strategies is that the data is available, hence backtesting gets a lot easier. As good as it may seem, the price based momentum strategy works well only when the market is trending up. When the markets turn choppy, the momentum strategy performs poorly, and when the markets go down, the momentum portfolio bleeds heavier than the markets itself. Understanding the strategy’s behavior with respect to market cycle is quite crucial to the eventual success of this portfolio. I learned it the hard way. I had a great run with this strategy in 2009 and ’10 but took a bad hit in 2011. So before you execute this strategy, do your homework (backtesting) right. Having said all of that let me reassure you – a price based momentum strategy, if implemented in the right market cycle can give you great returns, in fact, better more often than not, better than the market returns. Good luck and happy trading. Price based momentum works best in an upward trending market and not really in a sideways or a down trending market. Dear sir,What about volatility based delta hedging strategy? Kehav, perhaps I’ll add that sometime as an addendum. Moving forward onto the next module. When will Varsity Android app launch.. waiting for it.. Yes, eventually all the modules will be added to the app. Did you check out the wall feature? Thanks for an this topic was waiting for it to be covered.. 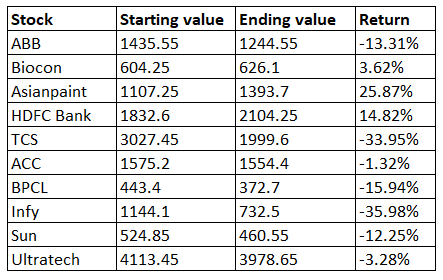 According to you which is the best source to get eod data which is adjusted of splits and bonus for bse 500 stocks apart from nse/bse websites. Nick, there are plenty of data vendors who provide you clean data. I’d suggest you subscribe to any of them. Unfortunately, I was unable to produce the excel, hence I took up the example of 10 stocks. At present I am investing on long-term basis and good results and very much Happy with the returns. I want to start trading shortly and watching articles related… thanks… waiting further. This module ends with this chapter. We are moving ahead with the next one. Sankar, I’m happy to hear that. The next module that I’m thinking about is more on personal finance, including topics on mutual funds. Sankar, thanks for the kind words. I’ll put my best efforts to put up a good module on PF. Coincidentally i was reading a book called. ” Stocks on the move by Andreas F. Clenow”. Awesome book on momentum strategies. Thank you as always for your efforts to make us understand jargons in a very simple manner. We are working on the PDF, should be up by next week or so. I wonder where to put stop loss in momentum strategy? in case I have intraday momentum portfolio, what shall be my stoploss? You can keep a 2% SL at a portfolio level, Arun. Sadha, I think you should check with an NSE approved data vendor for a solution for this. I have searched over the internet for the past few weeks and could not able to find one. Can you please help me and provide me a link where I could download historical data for multiple stocks at the same time??. Please note : I have not tried excel macros kind of things, is this can be downloaded only by this way? But this is one scrip at a time. For multiple stocks at the same time, I think you will have to speak to a data vendor. Thanks for putting in the efforts to compile this module on Trading Systems. You discussed Calendar Spreads in great detail and also discussed Momentum Portfolios. Do you think that you can add other trading systems to this module , for example Mean Reversion Systems and Trend Following systems ? can u please provide the pdf for this module? Looking into that Somi, will update soon. Ah, that can be a little tricky. Will check though. why i can not downlod this module in pdf ? all other module downlode in pdf then why is not ? We are yet to make this as a PDF, working on it. Sir, I have been live testing momentum portfolio and thanks a ton for this chapter. My question is, I want to get more into Quantitative Trading and want to learn more like the Pair Trading strategies you’ve put up. What do I start for this? What kind of Statistics do I start learning? You need to know the basic of descriptive statistics, Sundeep. The ones that I have explained is the starting point for this. I’d suggest you pick up from here and learn more in that direction. Sir, how to calculate 1 year return… is it the algebraic sum of daily returns over the year? Or is it just with the two values at the start and end of the year?..If it is the latter then, could please verify the example calculation of yearly returns of ABB that you have shown.The ending value is wrong when taken from the table in step 3. If the return is for less than a year, then a simple absolute return will do. Yes, the start and end of year value will do. Can you please quote the numbers that you are seeing? I’m unable to figure. I Just wanted to know if the ending value is the close price on 6th March 2019 which is not specified in the sample tracking universe table. Sir, and also why do we need the entire 1 year historical closing prices to calculate the yearly return of a stock .What if we get to know only the starting and ending closing prices for that period or year? You need daily returns to see the trend. Starting and ending values gives you the absolute return. Thats right Karthik, the ending value is the closing price on the last day. I Would like to know whether,if we download Bhav Copy Archive of Historical Data for any Scrip from BSE/NSE. Do they Adjust all corporate actions like Stock Split,Dividend,Bonus issue etc. Inorder to perform BackTesting on a particular Scrip say from 1999 to 2019.How can we rely on that Data?